Total joint replacements represent some of the most commonly performed procedures in the U.S., and their number is expected to grow. Even with the high volume of these surgeries, there’s significant variation for hip and knee replacements, especially with respect to cost of the implants. 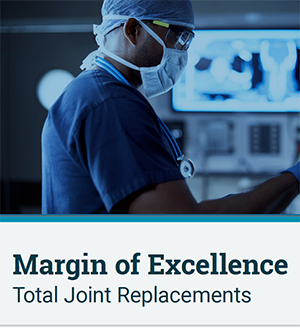 “Margin of Excellence” is a series of reports dedicated to uncovering next-generation total cost management savings and quality improvement opportunities through integrated data and services. The data and benchmarks can be leveraged to implement evidence-based strategies and tools designed to tackle inefficiencies in healthcare.